"In his Buddhist Meditation, Edward Conze puts it plainly: 'Meditational practices constitute the very core of the Buddhist approach to life. '1 To presume that the wisdom gained from mental culture is equally available to intellectual analysis, even of the highly refined and subtle, sort, is to presume that a job requiring a laser can be done equally will with a blowtorch. 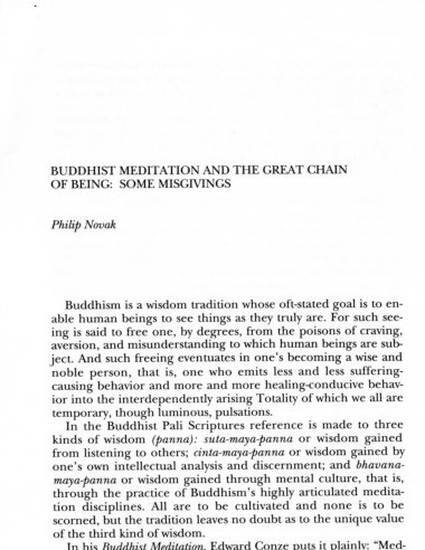 The Buddha's deepest insights are available to the intellect, and powerfully so, but it is only when those insights are discovered and absorbed, by a psyche made especially keen and receptive by long coursing in meditative discipline, that they begin to find their fullest realization and effectiveness. Copyright © 1989 Aquinas Institute of Philosophy and Theology. All rights reserved.